In my quest for fitness, I decided to quit sodas. I might have one as a treat every now and then. However, I am quitting the every day soda. In fact, just the other day my fiance was paying for our food and ordered fountain drinks for all of us. I quickly corrected him and changed the order to two, not three. I drank my water from my water bottle instead. I carry this bottle with me everywhere! Even so, a nice treat is nice. BUT it has to be a treat, otherwise it beats the purpose of calling it a treat. 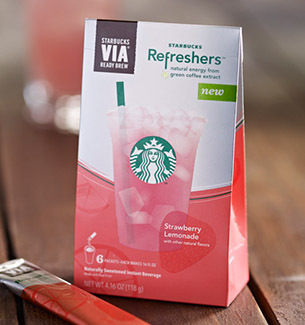 This is where Starbucks Refreshers are coming in as an alternative to Coke. Serving size = 12 oz., Strawberry Lemonade Refresher used for comparison. Now, I have heard that the vitamins in Starbucks refreshers are synthetic, so I can't say that these beverages are technically healthy. However, if you are looking for a sweet, carbonated beverage with a gentle amount of caffeine and an energy boost (via vitamins), I think its a good alternative. Perfect for an afternoon pick me up. Carbonated water, fruit juices from concentrate (white grape, apple, lemon, strawberry), erthyritol, natural flavors, green coffee bean extract, citric acid, vegetable juice (color), rebaudioside-A (stevia leaf extract), panax ginseng root powder extract, ascorbic acid (vitamin C), niacinamide (vitamin B3), calcium D-pantothenate (vitamin B5), pyridoxine hydrochloride (vitamin B6). Contains 25% juice and 50mg of Panax Ginxeng per serving. Plus, the ingredients in the Starbucks Refresher can sound more appealing to me than a can of coke. There are certainly more ingredients in the Starbucks can, but no high fructose corn syrup. Stevia is a natural sweetener that is low in sugar and Calories. Instead of using artificial coloring, the refresher uses vegetable juice for coloring. I really like the refreshers out of the can (same with cokes), but I have also tried the Via powders. The nice thing about the powder is that you don't have to use the whole packet. The bad thing about the packet is they don't dissolve very well. I find that after mixing it up if I let it sit for a bit, it will dissolve more. One packet supposedly makes 16 oz. Well, I don't own 16 oz glasses. My tallest glass is 12 oz. 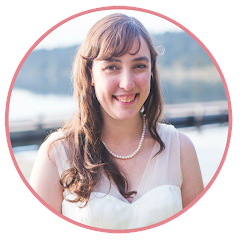 So here's what I do. I mix half a packet with 12 oz of carbonated water. This makes a yummy treat that is only 35 Calories! 12 oz used for comparison. Assumed 2% milk and no sugar in coffee. Tea assumes no milk or sugar added. 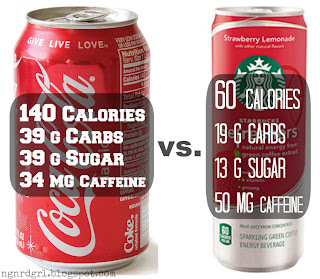 *When beverages contain less than 5 Calories, companies are not obligated to report it and can claim 0 Calories. I don't know why, but I have never really been into tea. Sometimes I like to have an un-caffeinated cup before bedtime. My doctor actually prescribed chamomile tea to aid in sleep. It definitely helps me fall asleep, but then I end up waking up to pee numerous times. 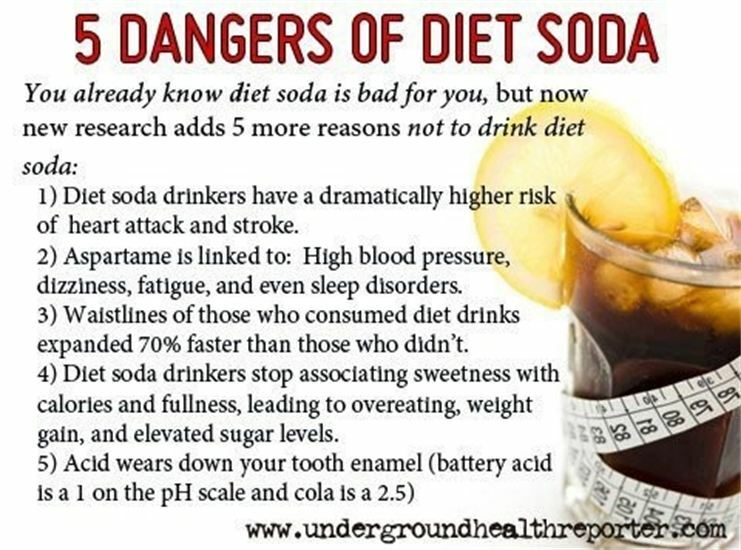 I am a huge anti-diet-soda person. The artificial sweeteners have me running for the hills. Artificial sweeteners have been linked to weight gain, high blood pressure and depression (see resources below). I'd rather just cut out coke then resort to diet coke (which is what I am attempting). Image courtesy of Just say no to diet soda! by Freak of Nature Fitness. For now, a cup of coffee in the morning is still my caffeinated beverage of choice. For evening beverages, I have been drinking lightly flavored carbonated water. For a weekend treat, I might choose a Starbucks Refresher for a soda substitute. What is your favorite beverage/treat? Have you tried to kick (or reduce) your favorite beverage/treat due to health/fitness reasons? How did you quit or what did you replace it with? Mmmm! I haven't tried these yet, but you've convinced me! They look so yummy! Thanks for the tip, friend! I have never been a soda fiend but do understand the addiction.. I love coffee(without sugar)...I buy these at Sams' club and love, love them. I pop one in the freezer until it's icy cold and voila! Yum. Yeah, I love coffee too. At least coffee has been shown to have health benefits. Although, I am sure I put too much cream in mine. I have an appliance that heats up the milk/cream and froths it. I then make my coffee via stove top espresso maker. It makes great coffee! Never heard of them before. What do the taste like exactly? They are sweet, fruity and carbonated. If you like sweet and carbonated, they are a great alternative to soda. We really like them. There are three main flavors: Strawberry Lemonade, Raspberry Pomegranate and Orange Melon. They do have stevia in them, which some people don't like. Stevia is a natural, low Calorie, alternative sweetener. I don't mind the stevia flavor in these. I think it is pretty well balanced with other sweeteners.